This walk was the beginnings of a journey in making heritage relevant for the pupils, laying the initial foundations of understanding what Colchester was like when soldiers returned from WWI and its impact on their society. Albert Street, Causton Road and St Peters Street – close to North Primary School, where former pupils lived. Stockwell Street – comparing the Francis Frith photograph taking in 1904. A pupil from North primary school lived at number 22 on the left of the photograph. Follow the link to view the photograph on the Francis Frith website. 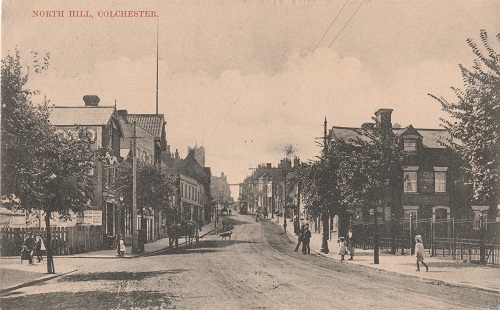 Colchester War Memorial – what the High Street was like before the War Memorial was built. 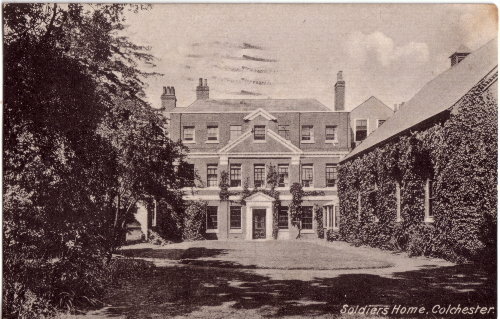 The Soldiers Home – Queen Street: one of many establishments offering rooms and entertainment for troops during the war. Link to image. St Botolph’s Station – where it is estimated that several hundred thousand troops left Colchester either for further training elsewhere or directly for the frontline. Colchester High Street – including the Grand Theatre – music hall and entertainment, the Town Hall – looking at the peace celebrations at the end of the war. Link to images. The Albert Hall and St George’s Hall – converted to a food hall and bathing site, recording 25 – 30,000 soldiers visiting a week. (Andrew Phillips, ‘Colchester in the Great War’). Essex and Suffolk Fire Office – The Society’s known commitment to doing all it could for the war effort. The Fire Office supplied clothes, boots, mattresses, pickaxes and washing facilities during the war. Link to website. St Peter’s Church: where pupils and their families were members of the congregation and attended Sunday School. Pupils from North Primary School are remembered on the roll of honour. Francis Frith image of St Peter’s Church 1907.